Are you looking for a course that teaches practical concepts, such as nutrition and etiquette? Family and Consumer Sciences offer this and much more in just one semester. The Family and Consumer Science Video Student Kit provide your students with all the necessary materials to complete a successful semester. 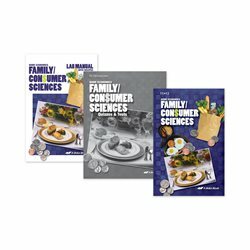 This kit includes the Family and Consumer Sciences textbook, the coordinating quiz and test book, and the lab manual. Be ready to teach your students about kitchen and food safety tips, dietary guidelines, meal management, food preservation, serving a party, and more! Whether using the digital or print version of the textbook, your students will learn to love cooking. Combine this kit with the Family and Consumer Sciences DVD Monthly Rental to aid your students in creating helpful habits as they establish their own homes and families in the future.